Michael Jackson's doctor Conrad Murray has been found guilty of involuntary manslaughter in the death of the singer who had been proclaimed the king of pop. The prosecution triumphed after six weeks of impassioned arguments and witness testimonies, arguing that Murray was responsible for a lethal overdose of the anesthetic propofol. Murray, 58, did not flinch and showed no emotion as the verdict was read. A few celebratory whoops were heard when the court clerk read the word, "guilty." The crowd outside the courthouse, made up largely of Jackson fans, erupted into cheers as the guilty verdict was read. Judge Michael Pastor denied a request by Murray's lawyers to allow him to remain free while awaiting sentencing on Nov. 29. Instead the judge said, "Public safety demands that he be remanded" to jail. "This is a crime where the end result was the death of a human being," Pastor said. "This demonstrates rather dramatically that public should be protected." The doctor, dressed in a dark pinstriped suit, had his hands cuffed behind his back and was led out of the courtroom to jail. As Murray was about to get up, Pastor told him to hold on, and added that they would discuss restitution at a later date. Murray could be sentenced to up to four years in prison and could lose his medical license, but at a news conference after the verdict, District Attorney Steve Cooley acknowledged that it is unlikely Murray will be spending four years in prison. 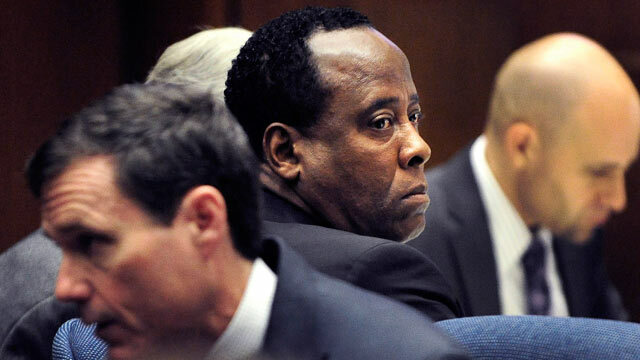 "It will be very difficult to achieve an appropriate sentence of incarceration for Conrad Murray," Cooley said, due to overcrowded prisons and Murray's lack of a prior criminal record. "There was a homicide. Someone lost their life. Three children lost time with their father because of so much criminal negligence," Cooley said. "The effort was worth it just to make that point." Cooley also said that Murray's felony conviction woud result in the automatic suspension of his medical license in California. Cooley said he hoped other states would honor California's convictions. Michael Jackson was 50 when he died June 25, 2009 as he was preparing for his "This Is It" tour, a comeback extravaganza that he hoped would restore him as a superstar. The judge told the court that he would seal the names of the jurors until further notice, and confidential records referring to the jurors were to be destroyed. The Jackson family arrived at the courthouse an hour before the reading of the verdict, led by parents Joe and Katherine Jackson. Randy, LaToya, Rebbie, Jermaine and Jermaine's wife were all in court. Family friends Rick and Kathy Hilton were also in attendance. The Jackson family exited the courthouse without making a formal statement. When LaToya Jackson was asked how she was feeling about the verdict, she said, "Wonderful. Absolutely. Justice was served. Michael was watching over us," according to ABC News' Los Angeles affiliate KABC. Joe Jackson simply said, "There's more." Prosecutor David Walgren spoke briefly to thank the jurors and sympathize with the Jackson family. "Our sympathies go out to the Jackson family for their loss," Walgren said. "They have suffered [the loss of] not a pop icon, but a son and a brother and I think that's most important to keep in mind today." Walgren's strong case and conduct in the courtroom garnered him many fans during the trial and the crowd was chanting Walgren's name outside the courthouse after the verdict. Today was the second day of deliberations. The jury deliberated for about six hours on Friday and for less than three hours today before reaching a decision. Murray was accused of causing the singer's death by administering the powerful anesthetic propofol and not properly supervising his patients or taking proper steps after Jackson stopped breathing. Murray has contended that Jackson gave himself the fatal dose while the doctor was out of the room. The six week long trial offered a window into Jackson's bizarre and eccentric lifestyle, peeks rarely allowed during the highly-private pop star's life. The trial began with a shocking photo of Jackson's dead body in a hospital gurney and a photo of his naked body from his autopsy. It featured a slurred audio recording of Jackson made on Murray's phone in which Jackson is so drugged that he can barely be understood. The case revolved around Jackson's inability to sleep without the powerful anesthetic propofol, a hospital grade drug, and a battery of other drugs as he was preparing for his "This Is It" concert tour. Prosecutors contended that Murray was willing to give Jackson propofol, which Jackson affectionately referred to as "milk," in return for a $150,000 a month paycheck. Murray told police that for two months leading up to Jackson's death, he had aministered propofol to Jackson in his bedroom almost nightly. Murray argued that he was trying wean the king of pop off of the drug. Jackson's chronic inability to sleep was one of many odd details of his life to emerge from the trial, along with such mundane things like his food preferences to strange medical decisions. Jackson's chef, Kai Chase, told the court that the notoriously thin star had penchants for beet juice and almond milk. He insisted on healthy food for himself and his three children and wanted lunch served at 12:30 p.m. every day. Through evidence and testimonies, it was also revealed that Jackson received injections of Botox in his armpits and groin and wore a urninary catheter while sleeping. Jurors listened to 49 witnesses over 22 days of testimony. Murray did not testify. Back in the jury room, jurors had more than 300 exhibits to look over.